Ginzler Endodontics, with two South Florida Facilities located in Boca Raton, and Coral Springs Florida, utilizes state of the art dental technology insuring the health of our patients. Root Canal Therapy should be painless, and enables patients to retain their natural teeth and bite which is the healthiest option when dealing with damaged pulp and nerve. We provide our patients with full documentation and transparency when diagnosing endodontic treatment. Dr. Ginzler is an Endodontist committed to the health of his patients. Your experience at Ginzler Endodontics will be comfortable and painless while receiving top tier dental treatment. 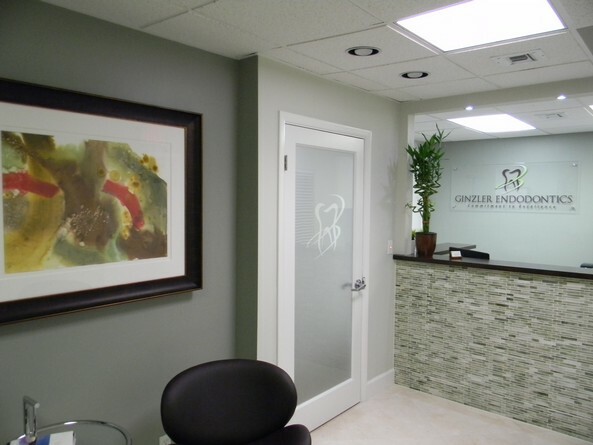 Dr. Ginzler established his endodontic office in Coral Springs, Florida to pursue his dream of creating a state of the art, fully digital endodontic office in 2011. Centered on optimal patient care, our new equipment and technology is unequaled in Broward County, and Palm Beach County. Our conventional 2D digital imaging reduces traditional radiation exposure by over 90%. We utilize limited field 3D imaging in both locations to help make the most accurate diagnosis and enhance treatment. We were among the first early adapters of this technology in South Florida. Our commitment to you is that you receive the best quality care available. When your General Dentist refers you to our practice, rest assured we will carefully diagnosis your dental condition and when needed, allow you to make an informed decision on suitable treatment. We are committed to providing responsible and excellent care for you and your General Dentist. Our secure digital system provides a simplistic platform to effectively communicate information to your dentist. It is also a forum for you, our patient, to preregister prior to your appointment with our Endodontic office. I had my very first root canal last Friday and feel very lucky that I was referred to Dr. Ginzler's practice. The staff is professional yet very friendly and understanding of a patient's apprehension. The office itself is not only zen like but state of the art. Dr. Ginzler explained the procedure from start to finish and before I knew it I was on my way home. Coral Springs and surrounding area dentists are extremely fortunate to have Dr. Ginzler and his staff to refer their endodontic patients to. I am a practicing dental hygienist and quite familiar with all that is involved in the endodontic process, but referring patients who are in need of a root canal is very different from experiencing it yourself! I have to say I am glad to have experienced this one in Dr. Ginzler’s office, because he is by far the most focused, knowledgeable, technologically advanced, and caring practitioner I have ever had for this procedure. The injections were painless, the procedure was painless, and the recovery quick and also painless. Dr. Ginzler prepares you for what is to take place, he has a steady and gentle touch, and he meticulously works to see that the final result is the absolute best possible. His staff is welcoming and kind, and his state of the art office is spotless and relaxing. If one could ever say they were glad to have a root canal, it would be that I can now share my firsthand experience of a most excellent job done. Thank you!